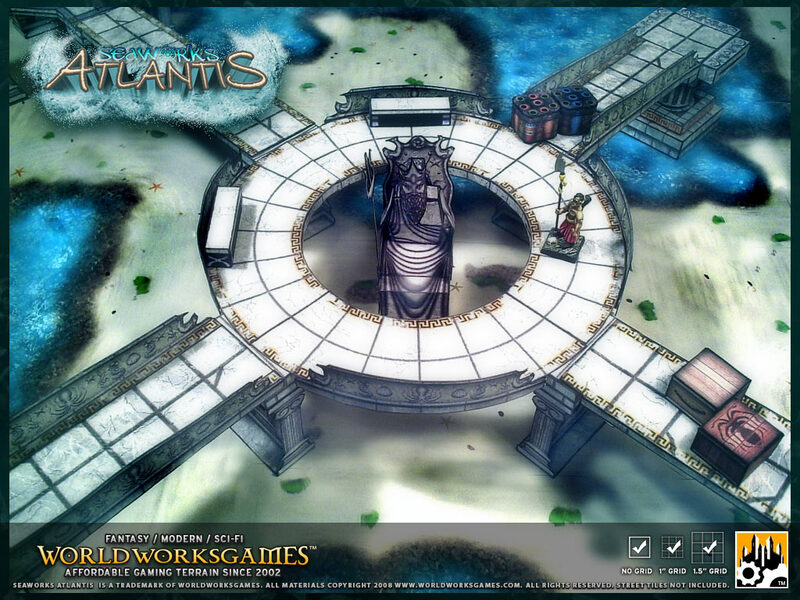 WorldWorksGames • View topic - ****RELEASED**** SeaWorks ATLANTIS Goes GOLD!!! 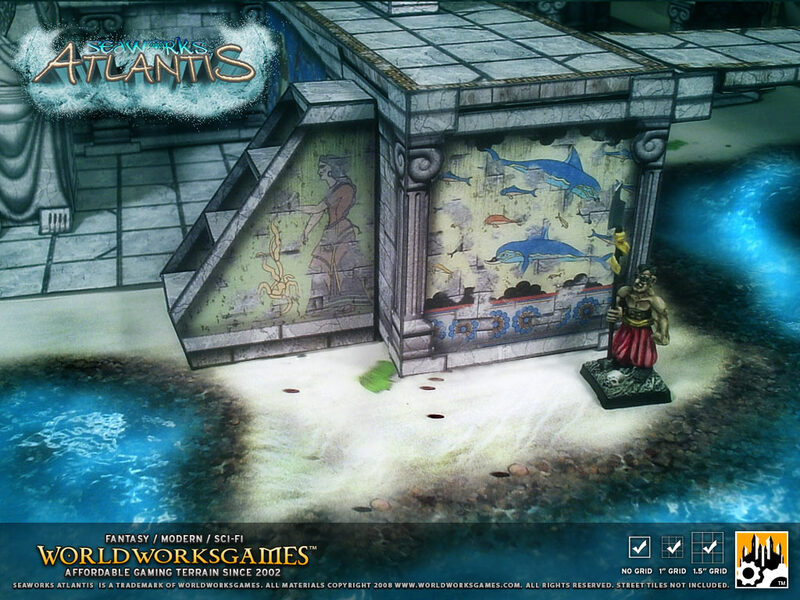 Post subject: ****RELEASED**** SeaWorks ATLANTIS Goes GOLD!!! 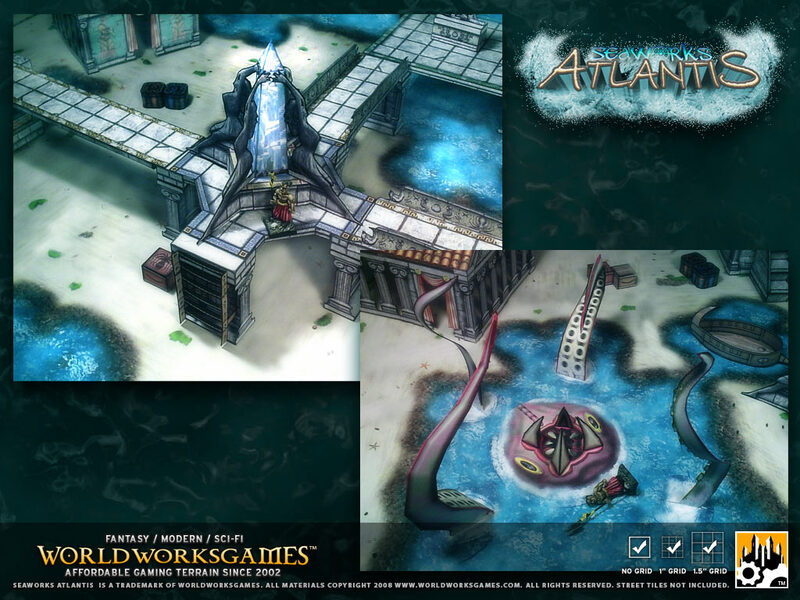 In another astounding project turnaround, Matt Lyon takes you to the mythical Atlantis...right before it falls into the ocean Feast your eyes on white sand beaches, lost civilizations and tentacles, lots of tentacles! 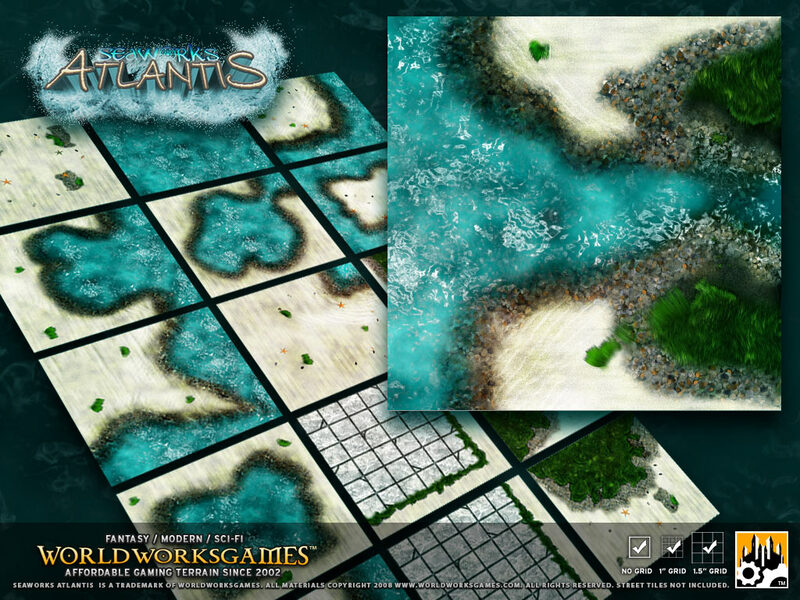 Lost to myth and legend, Atlantis now rises from the depths and lands on your tabletop! 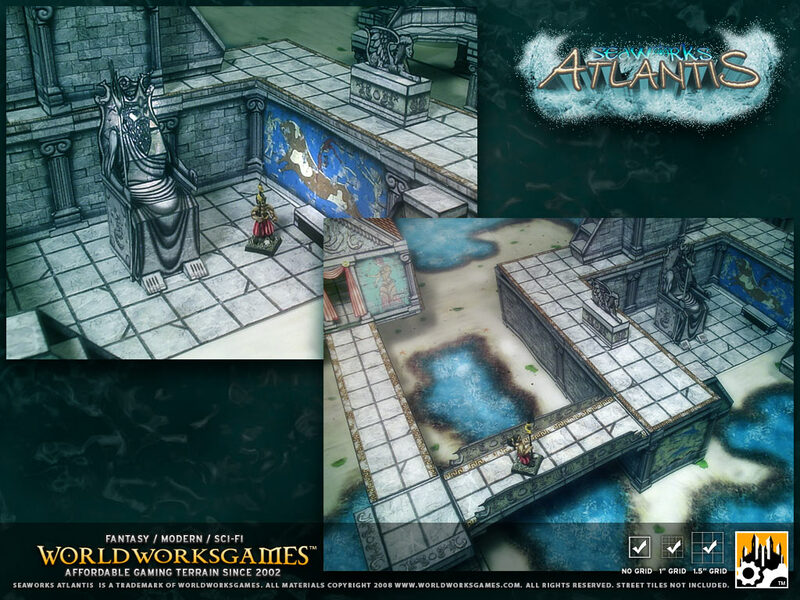 Adapted from the core of the Platform Command series, Seaworks: Atlantis puts a nautical spin on the elevated gaming concept, allowing you to create an ancient city of well-worn marble standing over a glimmering coastline of crystal blue water and sun-drenched sand. Visit the temple of the oracles! Make offerings to the statue of poseiden! Marvel at the giant crystal obelisks! Or just take a boat out for an afternoon sail. But don't go out too far... you never know what's lurking just off shore! * And as always, fully photographed instructions to take you through the build process. So what are you waiting for? Poseidon awaits!!! Last edited by Gamesmith Denny on 02-21-2009, 01:13 PM, edited 2 times in total. Beach party at Neptunes place! Cool stuff. Will the grass textures blend into hinterlands? I was just thinking the hinterland needs a way to do large bodies of water. Also how does the kraken compare in size with the maiden? It was said at one point that the set will blend into Hinterland, but I know nothing of the scaling of the Kraken. The kraken is made up of separate pieces. The "center" is a fair portion of a single tile (as shown above). the tentacles are separate standalone pieces, so you can have as many or as few as you desire, spacing them tightly or widely to suit your need. The tentacles can reach the main deck of the maiden comfortably. Atlantis and megamall are both having that problem with the wrong thumbnail pic being shown on the genre pages. Hmmm, that's weird. I'll look into it. Well your always going to have one complaint. Is WWG giving up hex grids already? I may have to give it a miss. It won't blend into my hinterlands as I printed it out with hexes. I suppose I could try and photoshop one in. At least you continued with the 1.5"
Nice!!!! I'll have to get this set for Aquaman needs a place to chill, along with Namor The Submariner. Watch world of superheros a new element has come into play!!!! This is a must have, Great work Matt!!!! Congrats on another beautiful set! With amount of work coming from this guy, he should get his own terrain name... MattWorks! I downloaded it this morning as soon as I saw it available! Again, congrats on another work of genius! Just to expand on what Talae said, the tiles are specifically designed to mesh up with Hinterland tiles. There's a one-side and a two-side grass-to-sand transition, and the river mouth matches up with Hinterland rivers/streams. A little something I whipped up...an Atlantis "lake" surrounded by Hinterlands greenery. It's almost all unmodified tiles (I took a few liberties with the stone platform in the north-east section). Hmm .... I've been struggling if I should buy any sets or hoard my money during this economic down turn. Sets like this really put some cracks in my resolve. Big ones!!!! I saw this last night, looks nice the Greek/Roman style collumns are cool, it will go on the list of stuff to get. The list is getting close to critical mass and one to two more sets i like will push it over. I think I have an idea stumbling from the depths of my depraved mind. Combining Atlantis with the Mars Station with Platform Command thrown in. . . . hmmm. . . . . They called me crazy . . . They called me insane . . .
Now who is crazy, now who is insane? Never call a man with a fusion bomb crazy or insane. He always gets the last laugh, and he always gets even. I think this would also work well for a floating city in the sky. Fantastic work Matt! Will be interesting to see where you take it with expansions. The PC: Battlegrounds thumbnail is also messed up. You know the annoying thing about WWG new releases? They're so damn insidious. Half an hour ago I looked at this and thought "Looks nice, but I don't really need it.". Ten minutes ago, I thought "Y'know, if I ever get round to that Necessary Evil campaign....well, that's got scenes set in sunken Atlantis..."
Five minutes ago "....actually, that can suit many 'Pulp' style adventures. Forgotten temples, hollow worlds, hidden cities..."
My resolve has not yet completely gone, but I can't see it lasting much longer than next payday! I don't bother any more. I'm just now getting around to building Platform Command. I just add the new stuff to my cart and check out. 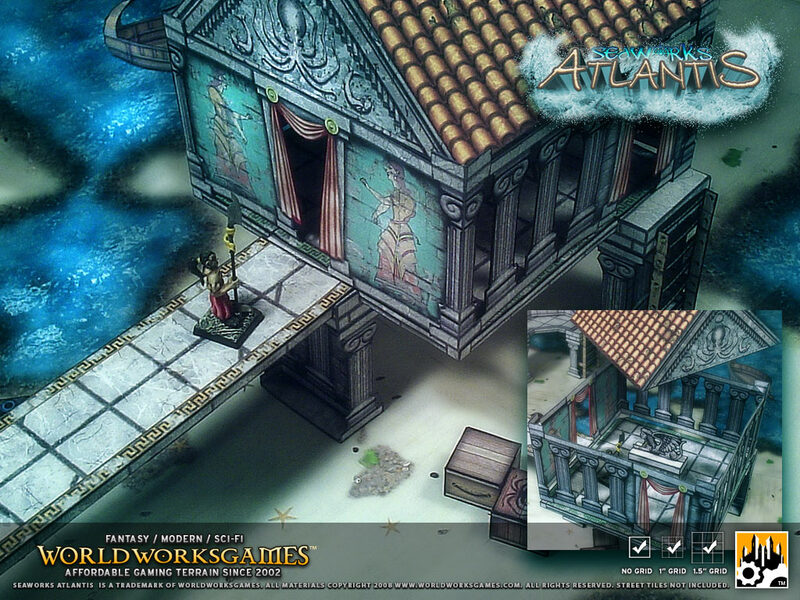 Thoumonts and Atlantis, will, I'm sure, get built ...someday.